At 7.17a.m. on the 30th June, 1908 the townspeople of Vanavara observed a bright, bluish light, brighter than the Sun, streaking across the Central Siberian skies. About ten minutes later there was a blinding flash accompanied by a sound similar to artillery fire. 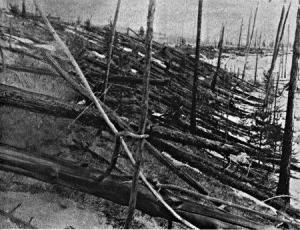 The native Russian people of Siberia had just experienced the largest impact event in Earth’s recent history during which eighty million trees were uprooted over an area of two thousand square kilometres, windows were broken and people were thrown to the floor. Fortunately there were no reports of people having been killed by the explosion. 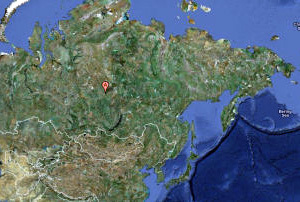 The explosion registered on seismic stations across Eurasia and fluctuations in the atmosphere – attributed to a noctilucent cloud from the collapse of a plume caused by the ejection of impactor material and water from the humid lower atmosphere to above the top of the atmosphere (according to Mark Boslough at the Sandia National Laboratory) – even the skies over the U.K. were lit up for several nights. Observatories in the U.S.A. detected dust in the atmosphere for several months. The first recorded expedition to the scene occurred in 1921 and the team were surprised to find no large crater but in 1927 a further expedition discovered that the epicentre of the explosion was determined by the radial distribution of flattened trees. Along with further expeditions, aerial photography suggested that there could have been four secondary centres of the explosion, consistent with several objects being involved in the event. There have been numerous imaginative explanations put forward for the incident amongst which are included – a bomb explosion, the end of the World, the annihilation of antimatter and (obviously) - a UFO crash. 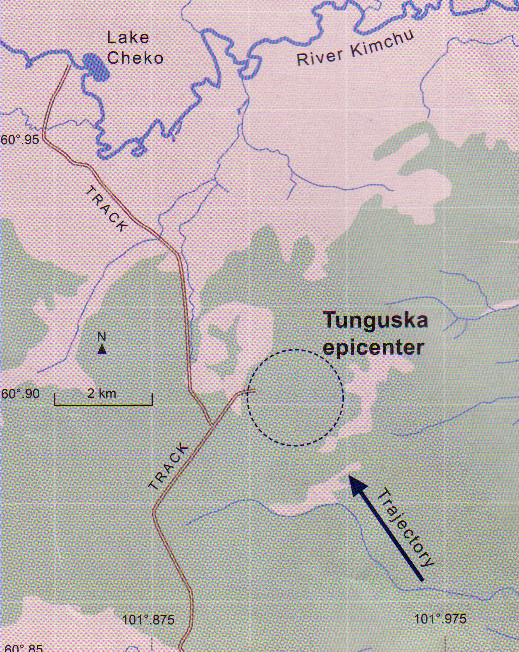 The "epicentre of the explosion"
Over the one hundred years since the incident occurred there have been numerous claims and theories put forward that the events as Tungunska were resultant of the crash of a craft from another planet – a UFO. Attempts to substantiate these theories have been made, on occasion, by both the media and UFO research groups. For instance, the television series “The Secret KGB UFO Files (Phenomenon: The Lost Archives)” in 1998, broadcast on Turner Network Television, referred to the Tunguska event as "the Russian Roswell" and claimed that crashed UFO debris had been recovered from the site. In 2004, a group from the Tunguska Spatial Phenomenon Foundation claimed to have found the wreckage of an alien spacecraft at the site. In 2009, Dr Yuri Labvin, the president of the Tunguska Spatial Phenomenon Foundation repeated these claims, based upon findings of the quartz slabs with strange markings on them found at the site, which, as he claims, represent the remnants of an alien spaceship "control panel". The proponents of the UFO hypothesis have never been able to provide any significant evidence for their claims but there is, in fact, little doubt that the events at Tunguska were caused by an object “not of this planet Earth”. The findings of the various expeditions and (especially) the observations made possible by the use of aerial photography indicate that the events were caused by the explosion of an asteroid in the lower atmosphere. This is substantiated by the fact that aerial photographs showed the existence of four secondary centres of the explosion which is consistent with the fragmenting of the asteroid when it exploded. By considering the evidence collated from eye-witness accounts, expedition documentation and computer simulations, most impact specialists agree that the explosion was caused by a large asteroid, just a few tens of metres across, that exploded at an altitude of five to ten kilometres above the Earth’s surface. New super-computer simulations at the Sandia National Laboratories show that the explosion would have probably been of three to five megatons, rather less than the ten to twenty megatons previously estimated. It is now known that as an asteroid penetrates the Earth’s atmosphere it is compressed by ever-growing resistance and ultimately the critical point of this wall of resistance will cause the asteroid to explode, transporting downwards at supersonic speeds a high-temperature jet of expanding gas – hence the fireball observed crossing the skies of Central Siberia. It is speculated that the existence of Lake Cheko, which is located a matter of miles from the epicentre of the Tunguska explosion, might well have been caused by a fragment of the asteroid hitting the ground at an angle. However, as yet there is no definite proof that this actually happened and an Italian team are investigating this aspect. 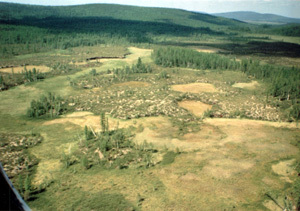 It should be remembered that if the asteroid that exploded over Tunguska had fallen to Earth just a few hours before, a whole different scenario may well have developed for there would have been a real chance that the explosion would have occurred in the skies over St. Petersburg, a highly populated area as opposed to the wilderness of Siberia. It is estimated that an event of the size of the Tunguska explosion may occur between a few hundred and a few thousand years and if such an explosion happened over a major city such as London, Washington or Moscow, then the city would be completely destroyed. Fortunately, cities occupy only a very small proportion of the Earth’s surface providing a tiny target when compared with, say, the globe’s oceans. But, these impact events are totally unpredictable and completely random in time and space – we will never know, until it happens! There is no evidence that Lake Cheko existed prior to the explosion but of this we cannot be certain as many maps of this remote area were incomplete.